The 50th Anniversary "1962" Sorrento Outfit features a laminated maple top and body, a mahogany neck with a 1960s SlipTaper™ profile, a rosewood fingerboard with pearloid dot inlays, 20 medium jumbo frets, historically accurate binding, a tortoise style pickguard, and Gibson USA mini-humbuckers. Like the Casino, the Sorrento is a completely hollow design that makes for a lightweight guitar with a wide range of tones. The “1962” Sorrento comes with a period-correct hard case and a 1962 Collection Certificate of Authenticity. Look for the Ltd. Ed. Sorrento in two beautiful color finishes, Natural and Royal Olive. Pickguard Imitation Tortoise w/Vintage Foil "E"
Mini-humbuckers were originally created by Epiphone in New York City prior to the company’s merger with Gibson in the late ‘50s. Jazz players and rock players alike love mini-humbuckers for their flexibility. Mini-humbuckers were favored by Johnny Winter, Pete Townshend of the Who, and Scott Gorham of Thin Lizzy among many others. Mini-humbuckers are a perfect combination of the “bite” heard in single coil pickups and the warm overtones found in PAF-style full-size humbuckers. 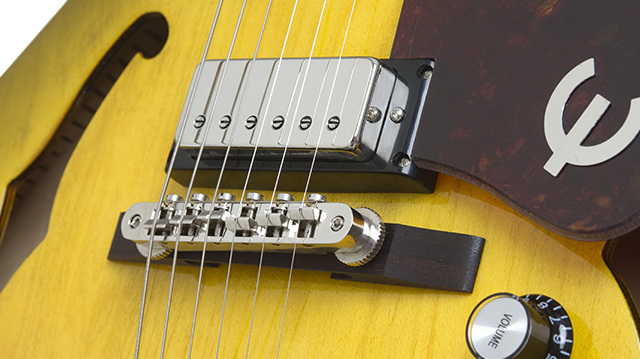 The Tune-o-matic™ floating bridge has a rosewood bridge base with a reissue of the original classic Trapeze tailpiece. The Sorrento’s electronics are top-notch Epiphone quality with CTS potentiometers, a ¼” non-rotating output jack, and black TopHat controls to go along with Wilkinson™ Vintage Style machine heads with small buttons and a 14:1 tuning ratio. 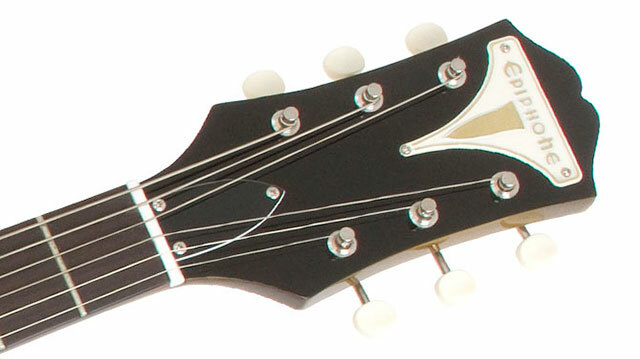 The dovewing headstock has a classic Epiphone metal logo badge and there is also a historically accurate “blue rectangular” Epiphone label.